Blockchain is transformative technology that has the potential to change the way enterprises, governments, and consumers coordinate workflows and exchange data and assets. Today at Oracle OpenWorld, Intel announced that its processor technology is being utilized by Oracle to deliver a cloud-based blockchain service to its enterprise customers. 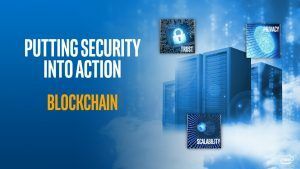 Oracle’s Blockchain Cloud Service utilizes Intel® Xeon® Scalable processors, which include a broad set of hardware-based features designed to enhance blockchain security and performance. Intel Xeon Scalable processors are an ideal foundation for building blockchain solutions, and partners see technologies like AVX-512 and AES-NI as valuable in optimizing the performance of cryptographic hashing and improving blockchain security.